Image: Ukraine’s Zaporizhia nuclear power plant with its six reactors is the largest in Europe and the fifth largest in the world. 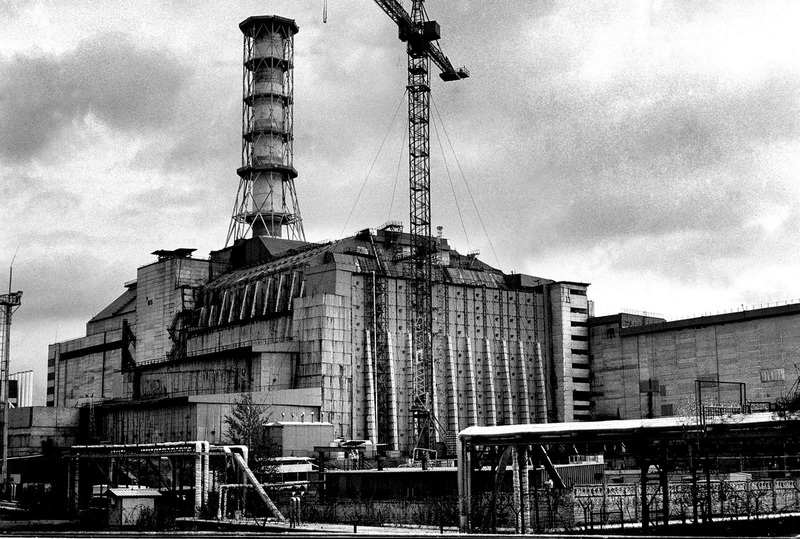 With the Chernobyl disaster in hindsight, 20 Neo-Nazi militants from Right Sector attempting to storm the facility constitutes a threat to much of Europe and western Russia – a threat NATO may be fabricating to create a pretext to more directly intervene in Ukraine. 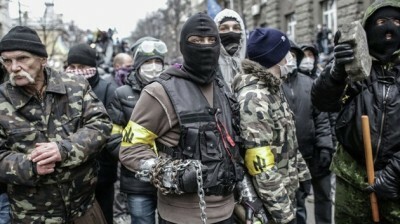 Right Sector, along with other Neo-Nazi militant fronts, spearheaded violence that led to the overthrow of the elected government of Ukraine in late 2013 and early 2014 in what was called the “Euromaiden” protests. Right Sector has since been used as a paramilitary organization by Kiev in an attempt to assert control over the rest of the country. Its mounting list of atrocities has led Kiev and its NATO backers to increasingly deny ties to the extremist front – however, it is clear that the group is operating nationally and in tandem with security forces loyal to Kiev. Asked if the study was carried out because of Kiev’s fears of Russian intervention in Ukraine, Dolhov said one reason was “possible destabilisation” in an area where strategic infrastructure was located. Ukraine told the U.N. atomic watchdog in March it was reinforcing the protection of its nuclear power plants because of “a grave threat to the security” of the country posed by the Russian military. Indeed, Ukraine is not a NATO member, and it is almost inconceivable under what circumstances NATO troops could enter Ukrainian territory – almost inconceivable. But a threat to one or more of Ukraine’s 15 nuclear reactors might give NATO the pretext necessary to deploy troops into Ukraine, particularly in the east where Kiev is unable to assert control. While NATO cannot justify intervening in Ukraine’s internal political crisis directly, it may attempt to make a case that a nuclear catastrophe directly threatens NATO members. With this catastrophe in mind, NATO may believe that by provoking a security risk to Ukraine’s remaining reactors, particularly the facility in Zaporizhia – Europe’s largest – it can create enough fear and support for a possible intervention in Zaporizhia province, preventing anti-Kiev forces from peeling the region away from Kiev as they have in Donetsk, Luhansk, and Crimea. Whether NATO is in fact attempting to intentionally create threats to Ukraine’s nuclear power plants as a pretext to intervene more directly in Ukraine or not is irrelevant. It is directly supporting the regime in Kiev that had organized and continues to perpetuate Right Sector who is currently creating such threats. However, withNATO being behind the chemical attack in Damascus, Syria in August of 2013 – the idea of NATO fabricating a similar pretext in Ukraine is not beyond the realm of possibilities. NATO’s inability to condemn and cut ties with the regime in Kiev, allows the menace of Right Sector to persist. The solution, likewise, is not more NATO intervention across the rest of Ukraine, but rather the undoing of the unelected regime it has put into power in Kiev in the first place. 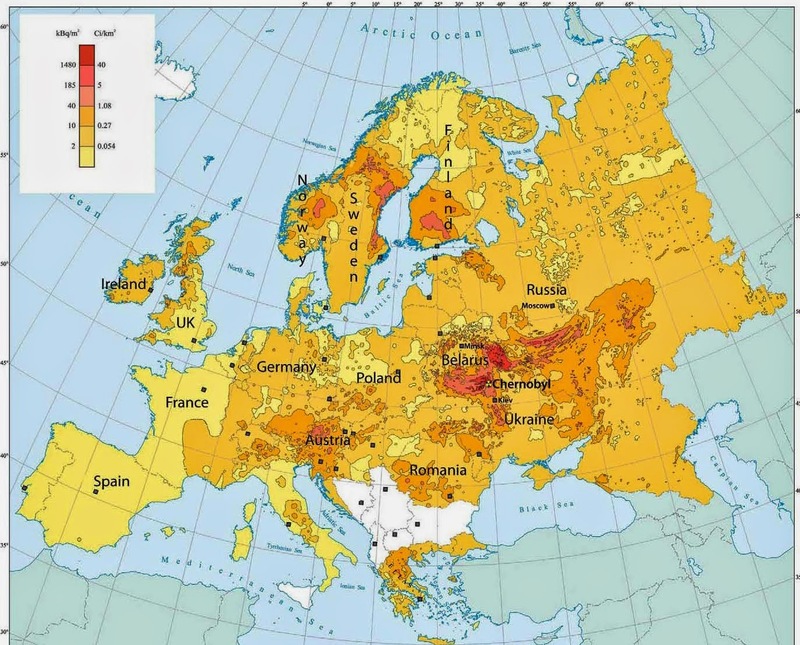 Image: Chernobyl’s disaster effected much of Europe & western Russia. Should Ukraine’s Zaporizhia facility continue to be put in danger, it is far more realistic and justifiable for Russia, not NATO, to mobilize and deploy, or support within Zaporizhia province, security forces to provide ample protection. For NATO, if a pretext to intervene is their goal, it will require time and may never materialize at all, considering their failures in Syria and the lack of trust or legitimacy they now command. In the meantime, Russia and its allies in eastern Ukraine can continue working to move Zaporizhia away from the dangerous regime in Kiev and its equally dangerous and irresponsible backers in NATO – just as has been done with Crimea, Donetsk, and Luhansk.